Ada pertanyaan untuk Viva Hotel? Terletak di Pusat Kota Kharkiv, Viva Hotel merupakan tempat yang sempurna untuk menikmati Kharkiv dan sekitarnya. Dari sini, para tamu dapat menikmati akses mudah ke semua hal yang dimiliki oleh kota yang aktif ini. Untuk menuju berbagai pilihan lokasi jalan-jalan dan obyek wisata setempat, Anda tidak perlu pergi jauh-jauh karena properti ini terletak dekat dengan Na Gagarina, Portal, Vovatanya. Viva Hotel juga menawarkan berbagai fasilitas untuk memaksimalkan pengalaman menginap Anda di Kharkiv. Fasilitas terbaik properti ini termasuk layanan kamar 24 jam, WiFi gratis di semua kamar, satpam 24 jam, layanan kebersihan harian, check-in/check-out pribadi. Para tamu dapat memilih dari 29 kamar yang semuanya dilengkapi dengan suasana yang tenang dan harmonis. Properti memiliki berbagai pilihan fasilitas rekreasi yang memungkinkan Anda melakukan bermacam hal selama menginap. 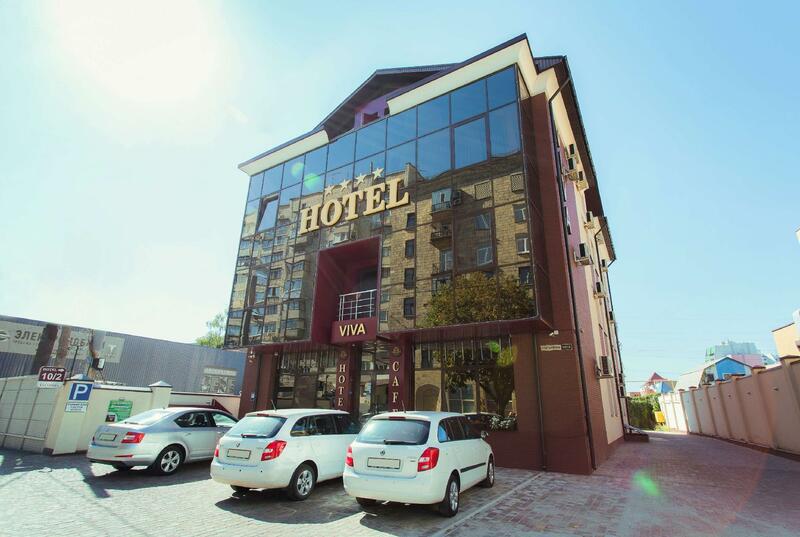 Apapun alasan Anda mengunjungi Kharkiv, Viva Hotel adalah tempat yang sempurna untuk liburan yang menyenangkan. This is the second time I’ve stayed here - I like the hotel. Although sadly this time my air-conditioner was very Noisy. Nice breakfast included. Slightly brash staff upon checking out but maybe I just read it wrong. I would stay here again for the right price. Near the center of the city, good location, convenient to everything in the center of the city. Clean, quiet, well priced. I am very demanding! And I want to notice that the hotel VIVA satisfied all my demands! I want to say thanks all staff, you are wonderful and helpful, All questions are decided quickly and positively. Breakfast is generous and hot, Drinks in any amount - coffee, juice and tea at breakfast. The rooms are spacious and comfortable, new furniture, towels and bed linen - all are ideal. I'm not the first time here and will come again, here as warm and comfortable, honest helpful staff - it is really rarity. I was on a business trip and chose Vivа Hotel. I was pleasantly surprised by the staff, very friendly and helpful people, they do not want a reward or some benefits, they really want to help! I needed on business issues find a local printing, the hotel staff found on the Internet address and all the information, they helped me with the translation, and called a taxi for me, and all this is free of charge and with a smile. Has pleased hot and quick breakfast, even all the drinks during breakfast are available in unlimited quantities. A pleasant interior, helps to relax after work, cleanliness and comfort were quiet in my room. WI-FI worked without denied and quickly, it is very important in my work. The atmosphere of the hotel is warm and pleasant, not every hotel can boast such. Thanks to all people who created it. Definitely recommended! Not the first time I was in Kharkiv for business trip, but in such a wonderful hotel for the first time. Location of hotel in the city center, next to the subway and urban transport. The affable Administrator greeted me with a smile, answered all the questions. Room of hotel liked, spacious, clean and comfortable, high-speed WiFi, soft towels, as new. In the evening, at my request, was taken dinner in my room. In the morning I got acquainted with the director, he was very kind and gave me a discount on accommodation. Administrator has organized a taxi for me without any overpayments, move around the city was very cheap, I decided easily all my affairs. I am delighted! Come and try it yourself! The most important thing is that you are here and happy to help for you and make your stay comfortable, no language barrier or other inconveniences. Only the positive emotions will definitely recommend this hotel. Хорошее обслуживание . Чисто . Уютные стильные номера .